Viper Blue - SHIPS FREE! Candy Apple Red - SHIPS FREE! The Jazzy 1450 is a bariatric power chair with an industry-leading weight capacity of 600 lbs. This heavy duty mobility aid maneuvers with amazing power and durability. It is uniquely design specifically to provide the smoothest ride possible. The Jazzy 1450 bariatric scooter has a patented mid-wheel design that utilizes the large, 14-inch wheels for front-wheel drive, ensuring that the chair will have no problem moving over a wide variety of terrain. The front 4-inch wheels serve as anti-tip wheels to increase stability and safety. The six-wheel design of the Jazzy 1450 makes it one of the safest and most efficient power wheelchairs on the market. The Jazzy 1450 power wheelchair moves faster than other types of Jazzy wheelchairs and can get up to 4.5 mph. This electric wheelchair also comes with a beautiful color shroud in either blue or read that will help hide any scuffs or scratches. A larger footplate is also included for increased comfort. 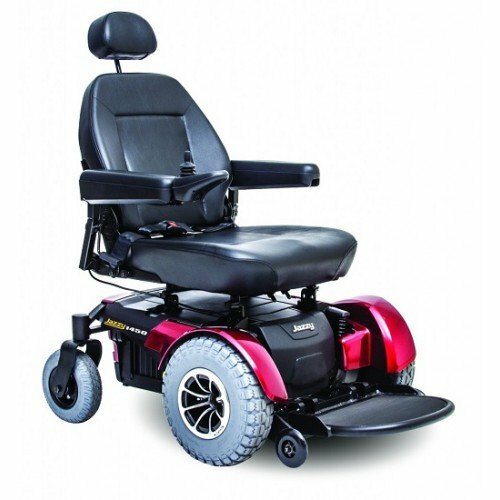 The Jazzy 1450 electric wheelchair comes with a beautiful, padded seat that looks polished and professional. This one-of-a-kind wheelchair will be one of your best investments. 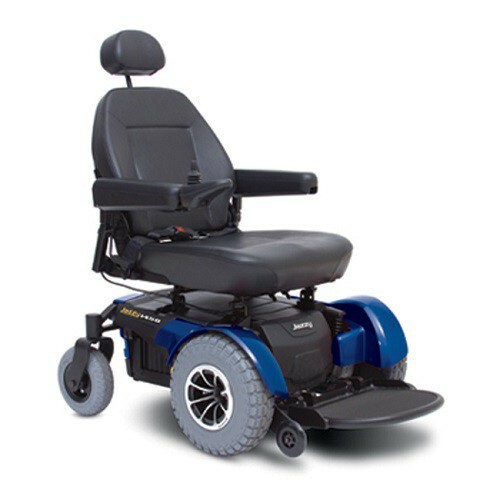 You might also be interested in similar power wheelchairs that we offer such as the Jazzy Elite HD.